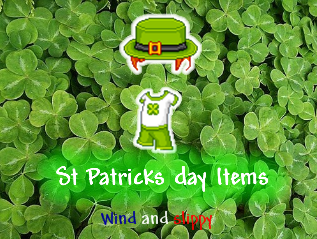 Well St Patricks Day Is Here Again So That Means More Items! ST. PATRICKS DAY RULES!!!!!!!!!!!! HAPPY ST PATTYS!!! 2009 because i’m new and i was not here in 2008.
by the way wind new in fantage is getting in the window of top modle. I CANT WIND SLIPPY ANSWER ME I NEED 2008 STUFF!!!!! !I CANT GET UP TO WINDOW!!!!!!!!!!!!! i just figured out how to get in the window! this is how! 7.go over higher and go in the window! have you got in the window? which sever do you go in most? do you know slippy in real life? do you and slippy see eachother on fantage? P.S.S.S i want to meet you somewhere kk? do you now about the clues the blog is giving us? i think it is a circus comeing to fantage!